As the premier yacht rental company in Chicago, Anita Dee Yacht Charters has offered incredible yachting experiences to everyone from local businesspeople, to dignitaries, to famous actors. Whether the occasion is a wedding or a product launch, the setting on a beautiful yacht cruising past the iconic Chicago skyline is always the perfect choice. Anita Dee Yacht Charters doesn’t just offer views, though, it offers an ideal way to travel to some of Chicago’s many incredible sites. Among them is the Sheraton Hotel. Founded by Tony Difigilo in 1981, Anita Dee Yacht Charters has sailed Lake Michigan and the Chicago River with more than a million passengers, providing each guest with a unique and extraordinary experience. With two yachts, we are able to host everything from large (up to 400 people) business events to more intimate gatherings. We are experts at hosting breakfast meetings, anniversary gatherings, trade shows, weddings, birthdays, fundraisers, and many other occasions. Whatever requirements your particular event needs, we are able to meet them. 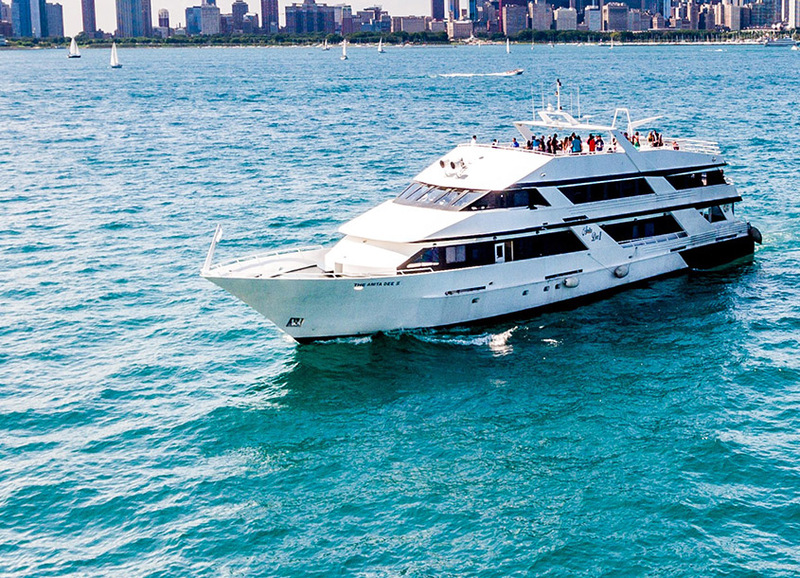 Whether you are local and want to give your clients a new view of the city, or you are visiting and want to relax at a class reunion in luxury, Anita Dee Yacht Charters can provide your perfect Chicago yachting experience. Contact us today at (312) 379-3191, or fill out our email form to set up your yacht charter. In addition, the hotel has a full gym and an indoor heated pool that overlooks Lake Michigan. There are also several restaurants, including a cafe and a bar within the hotel, designed to accommodate the needs of every visitor. From the Sheraton, many of Chicago’s best attractions are within walking distance. Get off the boat and stretch your legs while you enjoy a stroll along the Chicago River that runs from Navy Pier and Lake Michigan straight through to downtown. World famous for its large art pieces, including the Cloud Gate. Also known as “The Bean,” it is a stainless steel mirror that has become perhaps the iconic selfie image of the whole city. The park is also home to Crown Fountain, which displays two interactive video towers that delight children as well as adults. This large park has been called the “front lawn” of downtown Chicago, and it is full of activities in all seasons, including a theater and an ice-skating rink. Walking through offers excellent views of the skyline as well as access to a large number of shops and restaurants. Connected to Millennium Park, the Art Institute of Chicago has some of the most famous pieces of art in the world. Within the museum, you will find American Gothic by Grant Wood, Nighthawks at the Diner by Edward Hopper, and A Saturday Afternoon on the Island of La Grande Jatte by Georges Seurat, among thousands of other pieces. The gallery includes art from nearly every period of human history and every corner of the globe. Chicago’s great shopping district stretches for a mile north but starts right on at the edge of the Chicago River. Along this strip, shops as diverse as Bulgari and the Disney Store reside side by side. With a large number of high-dining restaurants and beautiful hotels, including many affordable options, the Magnificent Mile is a symbol of luxury and relaxation no matter your price range. Among the many attractions along the Magnificent Mile, there are several iconic pieces of Chicago architecture. Found here is the stately Wrigley Building, as well as one of the only surviving buildings from before the Great Chicago Fire, the Water Tower. Perhaps most impressive is Tribune Tower, which has inlaid in its walls pieces of famous rock. Simply passing by the building can be an education in the history of architecture in the city and worldwide, with fragments from the Taj Mahal, Hagia Sophia, The Alamo, Notre Dame de Paris, Independence Hall, and many others all cemented into its outer walls. Also on display is a piece of moon rock donated by NASA. Chicago is more than just museums, shopping, and beautiful buildings; it is also home to some world-class dining. Whether you are interested in deep dish pizza and Chicago-style hot dogs or something a bit more upscale, the area around the Sheraton can accommodate many different tastes. This restaurant has world-class steak, seafood, and wine that could impress anyone. This restaurant is often regarded as one of the best in all of Chicago. Located right inside the Sheraton, this steakhouse is perhaps one step removed from the Palm. While it offers a little less class (it is named after an NFL coach, after all), the food is still magnificent. Alternatively, if the Palm isn’t high-class enough, there is the two Michelin star Sixteen within a short walk. This restaurant, located on the 16th floor of the Trump Tower, overlooks the city and offers a menu that isn’t just delicious, it’s practically art. No matter what your expectations are for Chicago, Anita Dee can help you meet them. Whether you are looking for fun and relaxation or an impressive business venue, our yachts can give you a once in a lifetime way to enjoy one of the greatest cities in the world. Our yacht trips allow for customization to make sure you get to the locations that are most important to you. We encourage you to learn more about the Anita Dee and Anita Dee II by browsing our photo gallery and our prices for events. When you are ready to book a reservation, call us at (312) 379-3191, or fill out our email form on this site.